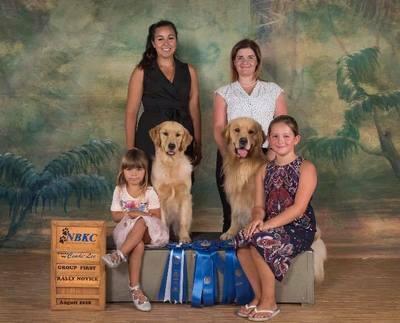 Danielle Bordage (white shirt)- Danielle created Nikmor with sights set of heathy, happy golden retrievers. She?s set high standards and Nikmor is well known for type and soundness of their dogs! April Saulnier (black)- April is a dog trainer, puppy evaluator, groomer. April stepped in later by owning Nikmor dogs. She now offers support for Nikmor dogs and their owners. April also guides dogs through all show rings. Madison Leblanc- (printed dress) Madison may be 10 years old but she?s a force to reckoned with. She?s been showing Goldens for a few years now and has some impressive wins under her belt including multiple Group 1st as displayed in the photo with Cash. Allissa (pink dress). Allissa is only three but her involvement is priceless. She?s an amazing child to socialize puppies and dogs with and very much enjoys engaging and training her Nikmor dogs. She attends the shows and loves watching her puppy Fancy win in the rally ring with perfect scores!